For my husband’s birthday I made him one of his favorites desserts and made it look awesome with very little effort. Angel Food Cake: Store bought or you make your own. Although, when buying pre-made make sure it’s fresh and doesn’t have artificial flavors and preservatives. 1. Wash all berries and slice Strawberries. Place in a bowl, sprinkle with sugar and mix to combine. Set aside. 4. 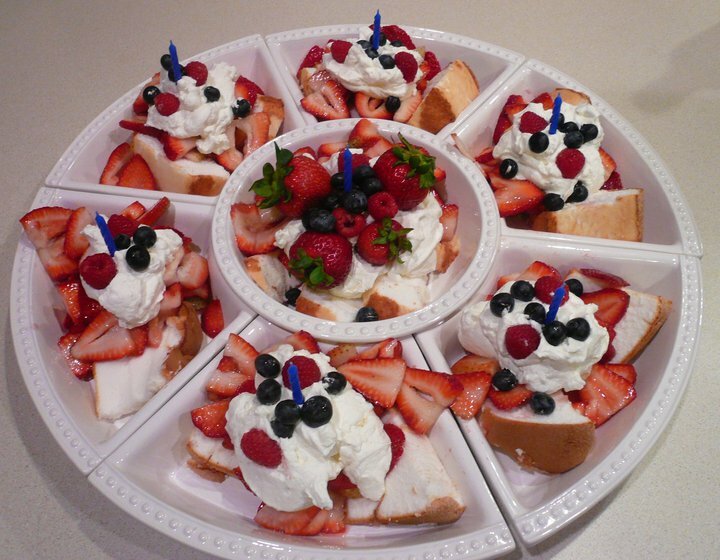 Pour berries over angel food cake, add whipped cream and if desired, add a candle on top and sing Happy Birthday! Regarding the picture: Platter I used is actually a dip platter with 6 individual bowls with a center round bowl. It worked out perfectly for the 6 of us who ate this. Plus the middle was left over for the birthday boy. This is also a great dessert for Memorial Day or 4th of July.